Laura Ingalls Wilder’s Little House books form some of my earliest literary memories. Reading them — first with my mom and then on my own — sparked my fascination with stories of the past, memories of true-life history fueling my imagination more than fantasy or science fiction. But history can be hard to pin down, especially when it comes to memories. 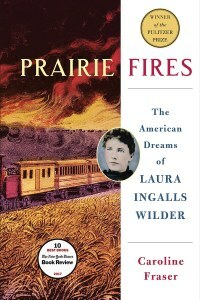 The personal truths Wilder shared in her bestselling books had a huge influence on our collective cultural memory of the Western frontier, one I never questioned until I dove into Prairie Fires: The American Dreams of Laura Ingalls Wilder, Caroline Fraser’s meticulously researched biography. By exposing the gritty reality behind the cozy, optimistic picture of frontier life Wilder’s books present, Fraser makes a compelling case that in their very contradictions, their nostalgic gloss on the pioneer struggle, the Little House books capture the ambiguity of Western identity. The myth of the self-made pioneer, an archetype that still reigns supreme in the West, is a recurring theme in Fraser’s study of Wilder’s life, which was often a direct rebuttal to the frontier illusion of self-sufficiency. Wilder’s beloved father, Charles Ingalls, never lived up to that ideal; constantly in debt, he shuffled the family from one parched homestead to another, chasing a prosperity always one good harvest out of reach. (Once, while living in Burr Oak, Iowa — a dark interlude not chronicled in Wilder’s books — the entire family split town in the middle of the night, unable to pay their rent.) Like many farmers, the Ingallses made ends meet by taking odd jobs in town; from the age of 9, the child Laura worked to support her family. Their poverty was not unique. Countless settlers lured to the Great Plains after the Civil War by promises of free land and fertile soil found nothing but struggle and starvation. Prairie Fires offers a lively chronicle of the history of westward expansion, grounded in the experiences of small farmers. The book links the land booms of the 1870s and 1880s to the Dust Bowl crisis a half-century later, drawing parallels between modern-day climate denial and 19th century refusals to heed warnings that the Plains were unsuitable for farming. 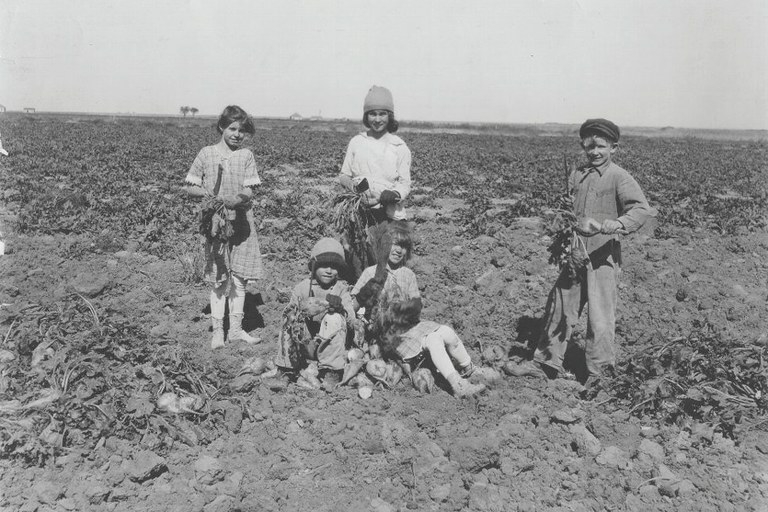 Children work in a Kansas beet field, c. 1922. His dealings with Indians and implicit reliance on the government — to protect settlers from the consequences of their provocative actions and remove Indians from land he wanted — were self-serving. He was willing … to take something that did not belong to him if he thought he could get away with it. Even the family’s legitimate land claims in South Dakota cast a shadow of hypocrisy over Wilder’s later disdain for federal assistance. For the hundreds of thousands of people pouring into Dakota Territory, taking advantage of the Homestead Act — which offered free land to anyone who could work it — meant capitalizing on what could be seen as the most large-scale, reckless government program of all time, one that triggered a half-century of violent conflict and brutal struggle for Native Americans and settlers alike. The genius of (Little House on the Prairie) lay in that tension between its ostensible pioneer subject — celebrating a destiny made manifest in claiming virgin land … clearing fields, establishing a farm — and its unmistakable appetite for the very opposite. How do we live on the land we love without changing what we love about it? When does our worship of self-reliance become self-destructive? Deftly weaving together literary criticism and historical analysis, Prairie Fires makes a rich, engaging contribution to our effort to understand our complex history.